Why choose to visit Ireland? So much to see and sample. There's a corner of Ireland with your name on it. You might not know yet how to find it, but it will find you. It might be some special spot amid this astonishingly diverse landscape, a place that takes hold of you and won't let go: The giddy heights of the Cliffs of Moher towering above the Atlantic...the serene lakelands of Fermanagh where time seems to stand still...a charming seaside town in the southwest such as Youghal or Kinsale, with crooked streets and a flotilla of colorful fishing boats...the majestic ruins atop the Rock of Cashel, mute witness to Ireland's golden age of saints and scholars...the spectacular basalt columns of the Giant's Causeway, a World Heritage site. 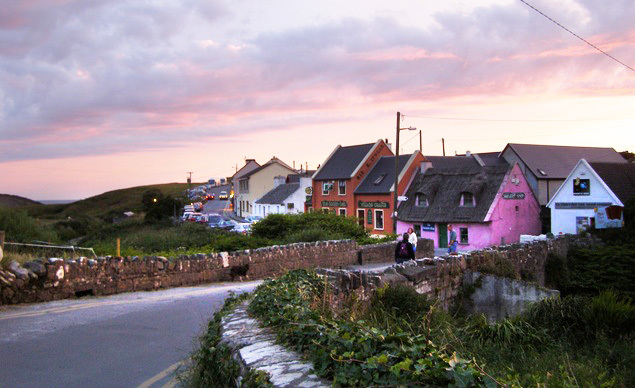 It might be a mood that comes over you all at once as you wander through the workshop of a candle maker in Oughterard, join in traditional music session in Doolin or Kerry, finish the perfect round of golf in Kildare, or walk through the panoramic Mountains of Mourne. And the people you meet, with their curious tales and captivating conversation-before you know it, they'll be inviting you for a chat and a cup of tea, and you'll be planning a return trip to visit your new friends. There is so much in this verdant emerald island to reward the visitor. The historic architecture of lively cities like Dublin, Belfast, Cork and Galway with a vibrant cultural scene, from theater to film to all types of music. Picturesque heritage towns like Adare and Birr cherish their links to the past, and reminders of Ireland's deep history are everywhere in the form of Celtic dolmens and Norman castles and medieval abbeys. A panorama of breathtaking scenery from gentle plains to lonely mountains, touched with the forty shades of green, invites you to hike, bike, horseback ride, tee off on Ireland's great golf courses (more than 350 in all), cruise or fish its rivers, or simply gaze into wonder- Ireland plays host to the prestigious Ryder Cup in 2006. The country's mild climate makes it possible to do most of these things year-round. There are homey pubs serving up Irish stew, Guinness, toe-tapping Irish music, and other traditional favorites, as well as excellent restaurants where the fabulous new Irish cuisine draws gourmands from around the world. So much to see and sample. But whatever you do, don't rush-the seductively unhurried pace of life is one of Ireland's chief charms. Not to mention the warm welcome that greets you everywhere you go. And there are so many ways to visit, whether you come for a weekend getaway or extended tour. We offer several types of vacations at your fingertips. Escorted Tours provide an all-in-one package that usually takes care of airfare, accommodations, motor coach ground transportation, sightseeing, and some meals,so all you have to do is enjoy. Independent Vacations set up the basics-self-drive packages cover rental car and accommodations:fly/drive options add airfare-then turn loose to wander at will. These packages include B & B vouchers so you can choose where to stay on the spur of the moment. And Special Interest Programs let you focus on your particular passion, whether it's golf, hiking, biking, tracing your Irish ancestors, exploring haunted castles or some other theme. Whatever type of package you choose, you'll find accomodations to suit every taste, from deluxe hotels to comfy B&B's, 5 star castles to rental cottages that let you settle in one spot. So come discover the Island of Ireland, the people, the place, the unhurried pace...discover the enchantment of Ireland.